Ben 10: Alien Force was a theme based on the Cartoon Network animated series of the same name. It was introduced in 2010 and discontinued later in that same year. 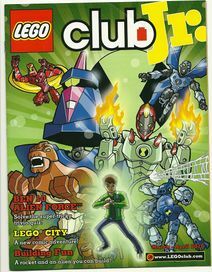 A theme based on Ben 10 was part of a business plan to popularize constraction with younger builders than BIONICLE had attracted. It was very unsuccessful with LEGO buyers and only lasted about 6 months on the market in some countries.[source?] Similar to other constraction themes, it is considered a TECHNIC subtheme. As seen on the Spring 2010 LEGO Club Jr. Magizine. Set five years after the events of the original Ben 10 series, Ben 10: Alien Force follows the 15-year-old Ben Tennyson as he trains a new team of teenaged heroes to fight the genocidal Highbreed and locate his missing grandfather, Max. The Omnitrix, the strange wristwatch-like device that allows him to transform into ten different types of super-powered alien, has recalibrated, giving him access to a new selection of breeds and abilities. The theme was small and short-lived, containing just six sets. Each set is an action figure version of one of Ben's alien forms, composed of between fourteen and twenty-two pieces. They are similar to BIONICLE figures but with simplified constructions and more specific parts. The theme was the first to use a redesigned ball-and-socket joint, intended to replace the earlier, more rigid kind that was prone to breaking. Each figure has glow-in-the-dark eyes and a glow-in-the-dark Omnitrix on its chest. A promotional brick, the Ben 10 After Dark Brick, was released at LEGOLAND Windsor. This theme spawned three combiner models which can be seen here, here, and here. Facts about "Ben 10: Alien Force"
This page was last edited on 12 January 2016, at 22:20.